This post is intended as a contribution to the latest Purpos/ed campaign: #purosedassess. Based on the work I have been doing in my classroom and research I completed towards my MA, I have come to the conclusion that the ultimate purpose of assessment is to help learners develop effective lines of communication. What you might call ‘communicative relationships’. The learner who can talk with their teacher, their peers and themselves about their learning will care less about what grade they got and more about what they need to do to improve. The first communicative relationship is between learner and teacher. It’s important that the teacher helps the learner to understand what it is they are trying to achieve. It is also important that the teacher (as expert) provide feedback, helping the learner to understand where they are at and how to progress. This is a relationship that needs to be carefully cultivated, managing expectations and establishing trust. Often, this can go wrong. Many teachers fall into the trap of feeling the need to meet the inherent expectations that I see in most learners: “The teacher is the person I go to for help; they are the expert and should always know the answers.” The problem with this is, the teacher will not always be there to provide the answers nor will they necessarily have them. The second communicative relationship is between the learner and their peers. This relationship helps the learner to clarify their understanding and also to realise that knowledge and skills can be developed through collaboration and inquisition; not reliant on the presence of an expert. This relationship is (IMO) the most important. When we leave the confines of academic study, it is our peers who we turn to the most, be it in the work place or our personal lives. The third communicative relationship is between the learner and themselves. Arguably, a by-product of the second relationship. If enough opportunities for discussion, collaboration, reflection and evaluation have been offered, in a supportive environment, then I believe that all learners can develop invaluable meta-cognitive skills. Like the first relationship, trust is of high importance here. Trusting yourself is difficult. It takes time to reach a point where you can be effectively self-critical, where you can trust your own judgement. Helping learners to do this is the final piece of the puzzle in helping them to become independent learners. I suspect (and hope) that these communicative relationships occur regularly in many classrooms. What is missing is the explicit and open linking of these lines of communication, resulting in richer/deeper learning. At the start of a lesson I inform the student’s about what they are going to be learning. I then offer them some possible ways of doing this and involve them in a discussion where we decide as a collective group on the best way to proceed. As well as developing the communication between the learner and the teacher, it gives them ownership over their learning. A skill that I often return to with my students is how to write effective analytical paragraphs. I often extend the initial discussion to get them to establish with each other the success criteria for such an activity. This gives them further ownership over their learning and blends the first and second communicative relationships. With this specific activity I may then model an effective paragraph, communicating clearly what success will look like. In doing such an activity I will always keep talking and asking questions involving the learner in the process. Too often, students are asked to do a piece of assessment, the work is either teacher assessed, peer-assessed or self-assessed, then put away; often never looked at again. This is something that I have learned to avoid. Instead I will plan the lesson (and often times, subsequent lessons/homework) to include opportunities for a single piece of work to be re-visited and all three types of assessment to take place. The different lines of communication offer the learner different, equally valuable, insights into their work. Early on with my classes I will arrange the learning in such a way that I assess their work first. This line of communication is pivotal early on as the expert needs to model what effective assessment looks like. I will then allot some time for them to reflect on this and to make amendments. Having made their amendments I will then ask them to peer-assess each others work. This will usually be in specific reference to the criteria they established earlier on. Again, this is followed by an opportunity to reflect and amend. Finally, I ask them to assess their work themselves before making final improvements. They can start to trust their own judgement based on the modelling and sharing that has already occurred. Time is not an excuse, this approach can be easily managed as a whole lesson or as smaller parts across a series of lessons. What’s important is the development of the communicative relationships and the opportunities to reflect and amend the work. As my students trust themselves and each other more, I push the second and third communicative relationships to the front of the queue, more and more reserving my judgement for later. While I don’t like it, we are part of an exam driven system and I won’t be there at the end to help them. By removing my input from the beginning of the assessment process they are developing the skills they need to be able to assess and evaluate their own work. Those internal conversations are imperative in the examination hall and will be imperative when they leave school. If we value these different communicative relationships in their own right then isn’t it obvious that they can be strengthened when connected? Take the time to look carefully at your lesson planning. Are you developing communicative relationships that can foster effective learning and assessment? You probably are… all you need to do is acknowledge them and connect them. 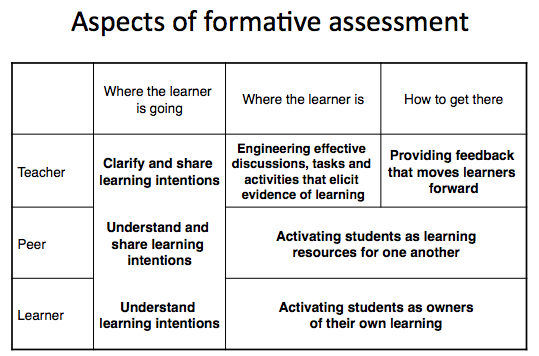 The outcome will be a strategy that has more to do with assessment for learning rather than assessment of learning. Great stuff, James – thanks for the contribution! “the ultimate purpose of assessment is to help learners develop effective lines of communication. What you might call ‘communicative relationships’. The learner who can talk with their teacher, their peers and themselves about their learning will care less about what grade they got and more about what they need to do to improve.”James – it is often useful to redefine the meaning of something to make crucial aspects clearer, to give us a new concept or vocabulary, and to find what is missing in the redefinition (which should be there but is not included – and so we can clarify what is meant by assessment). As an ultimate purpose I liked the use of a “communicative relationship”. It emphasises that important interaction which takes place between/amongst teacher, peers and self (although I would have preferred “reflection” to communication between learner and themselves). However, as you will know, it misses out the purpose of assessment as seen from outside the classroom walls, and this has such a strong impact (and the learner will care about what grade they got. Thanks for commenting George, I considered using the term reflection but specifically avoided as I was trying to maintain a clear focus on linking the types of ‘formative assessment’ with the concepts of ‘communication’ and ‘relationship’. As such I see the terms ‘reflection’ and ‘communication’ as interchangeable in this context. The reason I continue to rally for the use of rubrics in learner-centered instruction is they remain one of our greatest resources for supporting that third relationship – between the learner and his or herself. A quality rubric is a way for a learner to self-assess, to engage in that third type of conversation, without having to deal with with the time delay that are created by the first and second type. Regardless of how well a classroom community is set up, there will come a moment when a student will have that feeling of “I’m done” with a task, or worse “I don’t know how to begin” and there are no peers or adults available to give immediate feedback. A highly reflective learner, one deeply immersed in feedback, can ask themselves challenging questions about the quality of her work, her strengths and weaknesses, and establish her next steps. Most learners, thought, will elect to wait for feedback from a peer or an adult. A quality, well-written rubric that reflects attributes of quality related to what we experience outside the school walls can help cross that divide between current work and “better” work. Rubrics aren’t about being prescriptive – that’s the job of checklists and directions. Rather, they are a means to capture a picture of quality at various levels. This includes what it looks like when a novice engages in a task versus when an expert does the same; the difference between breaking the rules to create something new and powerful or doing the task incorrectly. Interesting thoughts, I think that any form of guide that supports students in developing a meaningful reflective practice in self-assessing their work is worthwhile, checklists included – I’ve had great success with these. I think the best rubrics give a student options… exemplifying the fact that there is not one way to do things but multiple ways. This opens up a more personalised and exploratory method of reflection and learning. Reflects my views on Reasessing Reviewal Process. Revision History in Google Docs is particularly helpful for amplifying this. This also explains my renewed interest in ongoing reflective learner portfolios as a means of assesment. Traditional means of assessment are discouraging, intrinsically demotivating and down-right inefficient. Thanks Simon, your thoughts strike a chord. Having done considerable work with Google Docs I’ve been using the revision history a lot. However, this has been mainly for the purposes of research. I have been considering getting my students to use it as a means of self-reflection. I’ve just struggled thus far to firm up a methodology behind it… obviously not wishing it to become a dull activity. There is a lot of information in there and not all students use/respond to comments in the same way meaning that the revision history for individuals will be very different in all cases. Before I leap into using it with students I need to come up with a clear/engaging pedagogically sound approach that will have a tangible outcome. Thoughts on this would certainly be welcomed. As a language teacher I have been using g docs as basis for individual portfolios – or rather working documents which will then constitute portfolios probably using g sites or other – choice up to students. I use the comment function for comments/corrections. The revision history can then be used as evidence for them and me of progress. After they have to write reflective reports on their learning as part of their assessments. They can/should use data from revision history again to justify/discuss their learning. Of course the revision history is also great for research but this research into learning process is also something I want to embark on collaboratively with learners. For more details take a look at my website/portfolio for work in progress. On Twitter profile or Taches de Sens in Google. Hope this answers question. All feedback most welcome. It’s all in French but I’ll gradually get round to English version and I keep promising myself a … Blog :-). Next Next post: Full Screen FTW!